The Guzzi EV Integral Braking System uses a hydraulic pressure proportioning valve. 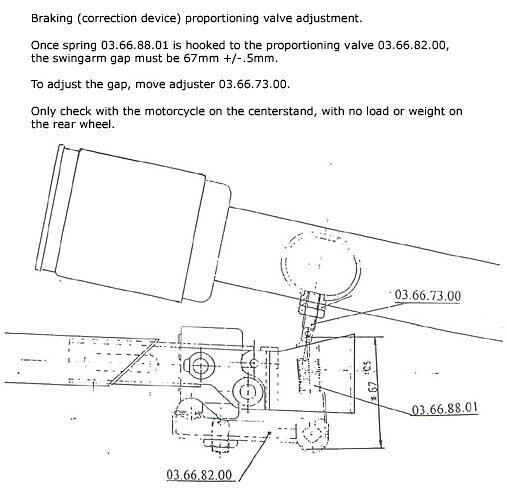 The valve is connected to the swingarm via a spring (I have broken two of these). Some riders have changed the rear shock absorbers in order to adjust final ride height. In doing so they inadvertently alter the function of the proportioning valve. Guzzi has a specific dimension for the adjustment of this proportioning valve. California-lined models are equipped with a "braking correction device". This device in mounts to the swingarm with a spring. When the suspension is compressed, this proportioning valve controls the oil-pressure ratio between the front and rear brakes. Heavier loads warrant more braking on the rear, while lighter loads offer more to the front. This "correction" is supposed to reduce wheel lock during hard braking. Warning: This system has been developed utilizing OEM shocks, and if the shock lengths are changed, dangerous braking could result. VIEW THE ACTUAL DIAGRAM HERE.